Growing up, our Friday night tradition was to head to our local fish house and eat fried fish along with fried pickles. I still often crave these on a Friday night, so I decided to come up with my own version. 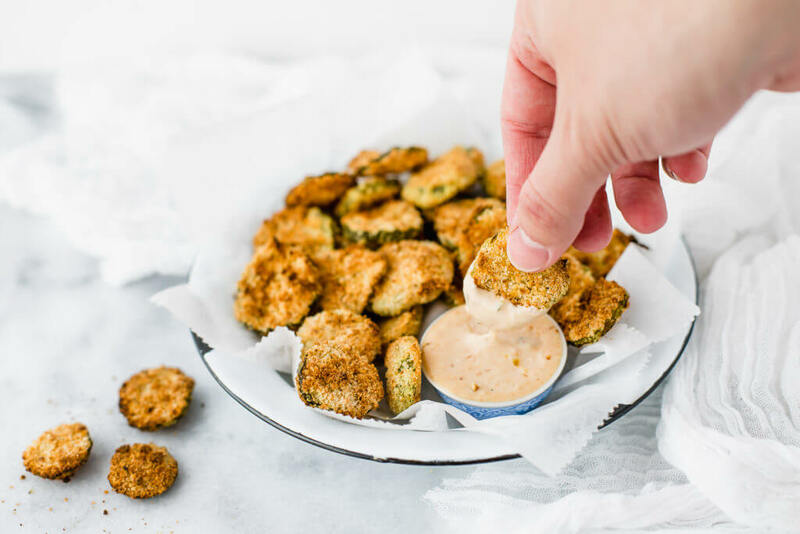 These Air Fryer Fried Pickles dipped in my Boom Boom Fry Sauce will make you forget all about the unhealthy version. If you are currently looking for a fun Super Bowl appetizer, look no further. My Air Fryer is easily becoming one of my favorite new kitchen gadgets. It makes cooking so quick and clean-up a piece of cake. These pickles are crispy and the perfect appetizer for any social gathering or summertime BBQ. The best news about these crispy little pickles is they are Whole30, Keto and Paleo along with being dairy and grain free. Not only does this serve as an amazing appetizer, but sometimes I will make them for my 4-year-old and serve with a sandwich. It is a great alternative for chips. You still get the crunch without all the funky ingredients and calories. My almond flour mixture is filled with seasoning that really brings the flavor of the pickles to life. Talk about flavor, when you dip one in my Boom Boom Fry sauce you will throw your head back and hands in the air and say “YES!” The dipping sauce is filled with a little bit of everything and is absolutely divine. It tastes a little like In and Out Burger’s fry sauce, but I like mine better because I know exactly what I am putting in it. I am here to tell you that if you put a little effort into the ingredients you use to create recipes, healthy can be extremely delicious and yummy. This is a fun recipe I love incorporating into my families life and always have it on the list for football games and social gatherings. Crispy and savory air fried pickles dipped in my creamy Boom Boom Fry Sauce. This recipe is Whole30, Keto and Paleo along with being dairy and gluten free. In a small bowl beat together egg and coconut milk. In a separate bowl, mix the almond flour along with the rest of the seasonings including the nutritional yeast. Place the 2 cups of pickles on a paper towel and pat dry. Dip each pickle slice in the egg wash, then the almond flour mixture until each pickle is completely coated. Working in 2 batches, place the pickle slices n the air fryer in a single layer at 390 degrees F and cook for 8-10 minutes or until golden brown. Serve with my Boom Boom Fry Sauce. First make the mayo base. 1 cup of LIGHT olive oil, 1 egg, 1/2 teaspoon mustard powder, 1/2 teaspoon salt, 1/2 tsp lemon juice. Add all your ingredients to a mason jar and use your immersion blender to mix together until thick and creamy. into a mason jar. If you do not have an immersion blender add all ingredients to a blender except for the olive oil. Turn the blender on medium speed and slowly add in the light olive oil until thick and creamy. Place 1 cup of mayo in a jar and add in the rest of the ingredients to the mayo base and mix together with a spoon. This sauce will last a week in the fridge.